Today took us into the Great Smoky Mountains and onto the Blue Ridge Parkway. We left our (somewhat smarmy) hotel room early to ‘sprint’ through Sevierville, Pigeon Forge and Gatlinburg. The number of attractions, theaters (okay, so the mind-reading pig did intrigue me), souvenir shops and themed hotels and restaurants were grossly fascinating. Titanic Theater in Pigeon Forge. ICEBERG! We wanted to make sure we made it through the throng before the hordes of summer travelers finished their pancake breakfasts. Seriously. I have never seen so many non-IHOP pancake joints in my life. We did pass up on Dollywood as well. Tom was heartbroken (NOT). We made it through entertainment row and then into the Great Smoky Mountains National Park. We were surrounded by lush green…I felt like I could BREATHE again! Road to the Smokies. MUCH nicer open road! As we traversed through the park and stopped at the many vistas, I was continually in awe of the beauty. I remarked to Tom about how much we’ve seen, and how different each of the National Parks has been. However, the lush woods of this park felt familiar and comfortable (okay, other than the sheer drops and narrow roads). The thick, wooded terrain really reminded me of New Hampshire. Along the way, we stopped in a number of National Park visitor’s centers. Tom, of course, made the best of each of the stops. No, I didn’t see any bears. Oh! It was only Tom! 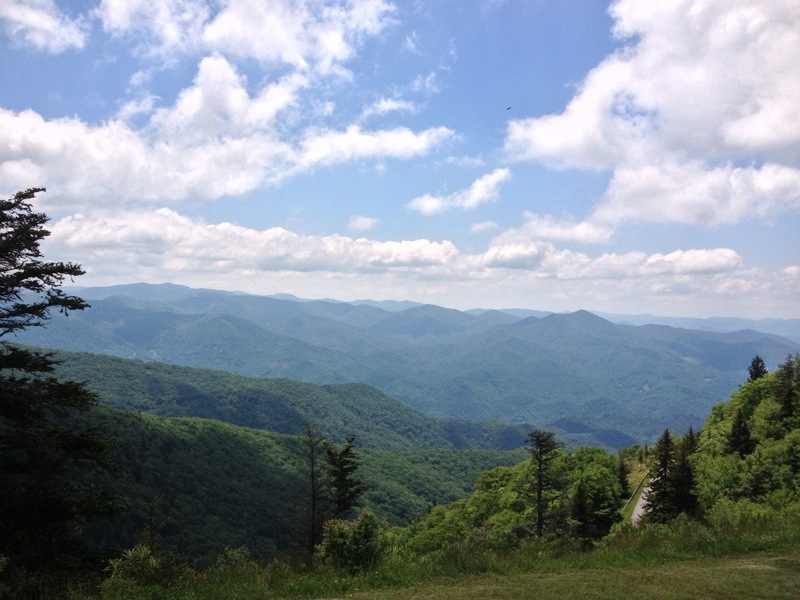 We picked up food before we ventured onto the Parkway, and we found a wonderful vista near the Waterrock Knob visitor’s center to spread a blanket and have a picnic. A perfect, warm day…and a perfect place for a picnic. Another bit of heaven. Happy feet! Having a picnic at Waterrock Knob Overlook. Soon we reached Asheville, North Carolina and our hotel for the night. We’re a few miles off the Parkway near the Biltmore Estate. It was kind of tough to find a dog-friendly hotel, but the Best Western came through…and even gave us a goody bag! Given the number of poop bags we’ve been through on this trip, this was a welcome sight! Thanks for the doggie goodie bag, Best Western! Tomorrow, we continue on the Blue Ridge Parkway, meandering across the Appalachians. Another day, another adventure! Note: I’m surprised that no one commented on the fact that my day count was a bit…off. 🙂 It has now been fixed!